I love Twitter. Actually, now that I think about it, love may be an understatement. When my blackberry is out, people automatically assume that I’m tweeting something (9 times out of 10 they are right). I tweet more than I text. I read my twitter feed to get weather updates, the local traffic report and breaking news (not to mention tweet-up deals!). Now this certainly isn’t the end of my #musethanks! Share yours! And have a Happy Thanksgiving! 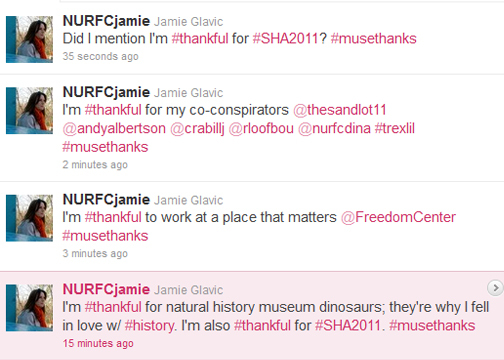 Tags: #musethanks, museums, Thanksgiving, Twitter. Bookmark the permalink. Previous post ← Seminar for Historical Administration: Thank You! Great blog, Jamie. Of course, you’re on my list of museum people for whom I’m thankful.